Carmen Manet from Slovenia have won the first edition of Eurovision Choir of the Year this evening in the Latvian Capital of Riga. Nine choirs from across Europe traveled to the Latvian Capital to take part in Eurovision Choir of the Year 2017. The competition which was held for the first time ever this evening saw each choir performing for six minutes and saw a variety of songs performed. From Austria’s performance which featured a song about eating vegetables, to Hungary’s entrants paying tribute to one of the countries most acclaimed composers, different styles, sounds and interpretations of choral music was heard. The winner of the competition tonight was decided by a jury made up of three music experts. The three judges were; Elīna Garanča – Mezzo-soprano (Latvia), John Rutter – Composer (United Kingdom) and Nicolas Fink – Conductor (Switzerland). The three judges were looking at the personality of the choirs, faithfulness to the piece they performed, quality of their sound as well as general musicianship. 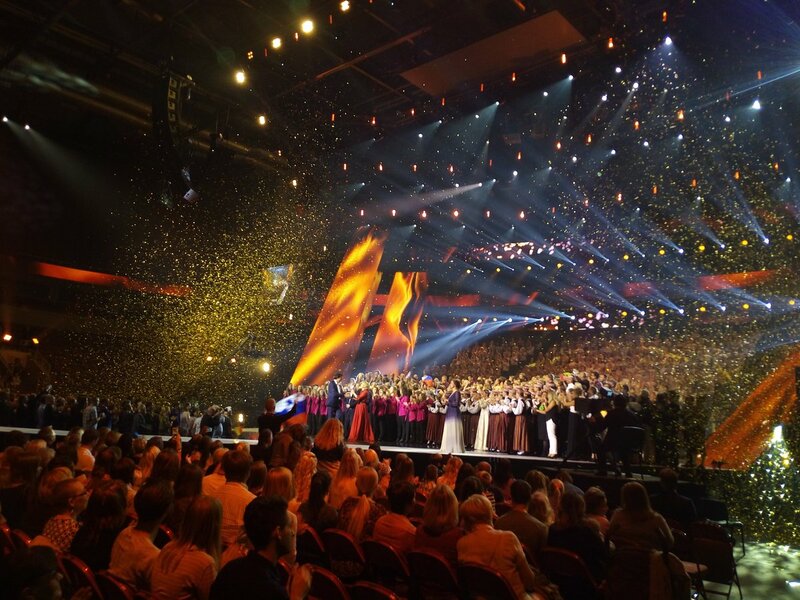 The winner of this years contest no only received the title of Eurovision Choir of the Year 2017, they also received a glass trophy and a prize of 10,000 Euros. Following this years competition a decision will be taken by the European Broadcasting Union and Interkultur regarding the future of the competition. The contest is currently planned to be a biennial contest according to the Head of LTV Kulturas, however if there is sufficient interest the contest may be held annually. Slovenia was my favourite! Congratulations! Congratulations to Slovenia, they were the best choir by far. A great winner! Hopefully Slovenia sees this and dicides to return to Junior Eurovision next year.